The keyboard-configuration option can drive you nuts. You’ll probably be okay when you’re done working through it. If you can’t get it to work, you may need another keyboard. The problem: There’s more than one way to arrange the letters on a keyboard. Keyboard layouts are not standard. There are some semi-standard layouts, but they’re not 100 percent everyone-does-it-this-way standard. So you need to tell your Pi which layout your keyboard has. If you pick the wrong layout, the letters on the keys don’t match the letters that appear when you press them. For example, if you type @ to make an email address, you get a ” instead. If you get the keyboard selection very wrong, you won’t be able to type some characters at all. The vertical slash | character (also known as pipe) can be a real problem. It’s very useful for Linux commands, but some keyboards don’t include it. The only way to fix this is to use a different keyboard. Select the Internationalisation Options and then select Option 3 — handily labeled Change Keyboard Layout. After a very long wait — it’s always longer than you expect — you’ll see a screen like in the following figure. This is really just a long list of keyboards from all kinds of keyboard and computer makers. A lot of this list is junk. Some of the names, like the Amiga and the Atari TT, are computers from way back in time. To pick a layout, move the red highlight up and down until you see a name that matches the keyboard you have. If you don’t know the name, select the Generic 105-key (Intl) PC if you’re in the UK, or the Generic 104-key PC if you’re in the United States. On the next screen, select the default option — in computer-speak, that’s the one that’s already selected for you — unless you have a Mac (for U.S.) or Mac International (for UK) ­keyboard, in which case select that instead. The next best option is the Extended WinKeys, but don’t try that yet. The following figure shows the next screen. Most keyboards have a special key labeled AltGr, which is used for typing non-English characters with accents and extra squiggles. There are too many possibilities to list here. A smart first choice is to press Enter to select “The default for the keyboard layout option.” If that one doesn’t give you the right letters in the right places you can come back later and experiment with the other choices. You can pick the default on the next page, too. It selects a key for a different set of complicated keyboard sequences to make an even wider selection of characters. If you’re in the UK or the U.S., ignore the AltGr/Compose questions. You probably won’t be typing emails in French or Polish on your Pi. If you need to, or if you move to France or Poland, you’ll probably need to find a local expert to set all this up for you. There are experts who have worked with computers for years and still don’t get how this stuff works. Finally, leave the <No> option selected for the question about the X Server and press Enter. Wait while the Pi makes a keymap. Select the <Finish> option — use the right/left arrows and Enter — and try typing some of the less common characters on your keyboard. If the @, “, ~, £/$ characters all work, you’re probably okay. 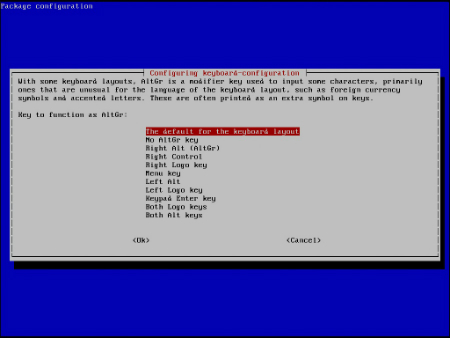 If all the characters don’t work, use the sudo raspi-config command to go back into the Internationalisation Options and the Keyboard Configuration to pick a different keyboard layout. If you can’t get it to work after a couple of tries, go buy another keyboard with a different layout, and try again.